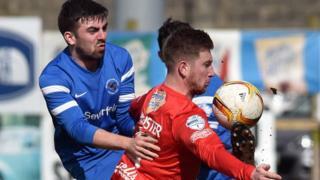 Portadown end a run of four consecutive defeats with a 0-0 draw against Ballinamallard United at Shamrock Park. The Mallards had more chances in the contest but Portadown's Gary Twigg headed a point-blank chance against the woodwork with Ross Redman failing to connect with the follow-up. Ballinamallard remain 11th in the table - one point ahead of basement club Warrenpoint Town - with Portadown in ninth spot, four points ahead of the Fermanagh outfit.